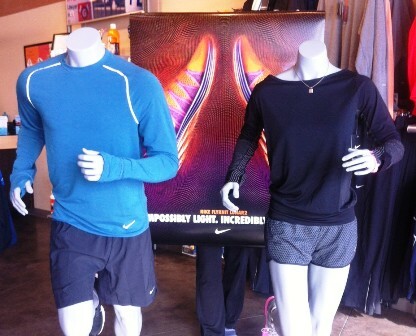 Check out our Nike Base layers. The women's has a v-neck that makes it fashionable as well as functional. Thumb holes are good for both the winter months when you need a little more coverage on your wrists and hands and for the chilly spring mornings. The men's base layer has wool woven into the fabric and are available in different shades of grey. Dri-Fit Knit is back (the seamless tops that we have had in tank, ss, and long sleeve), less seams means less chafing, better fit since they added some length and it fits close to the body for moisture management, and mesh panels for added breathability. Printed Rival 2" short - so cute! stretch woven for great movement, soft fabric, back zip pocket, wide waistband for comfort. More epic crops - not a capri and not a full length tight, this is the "in" thing! We have a new print! These fit great, dry fast, have the wide waistband, flattering lines, and have a back zip pocket. Most importantly for men, we brought back the 2-in-1 phenom 7" short. It is super lightweight with the laser perforation, has a great, supportive internal boxer, and pocket. Lastly, we got in the 5" inch short for men that always is a great choice for men. 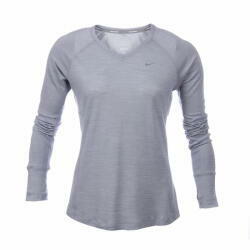 Come in to Fleet Feet Sports Madison and check out all our apparel by Nike.